His Holiness Archbishop of the Synod of the Ethiopian Orthodox Tewahodo Church has called on Ethiopians across the world to hold memorial services and prayers to commemorate the self-immolation of Yenesew Gebre, who died Monday after he set himself on fire last Friday. In an exclusive interview with the Ethiopian Satellite Television, the Canada-based archbishop urged Ethiopians to unify not only in remembrance of the immeasurable sacrifice of teacher and activist Yenesew but also in the effort to liberate Ethiopia from the tyrannical regime of Meles Zenawi. Abune Mekarios condemned the incessant repressions being committed by the regime that has been pushing Ethiopians to desperation. “The people have to tell them enough is enough,” he said. He also urged Ethiopian spiritual leaders to stand for justice and freedom. 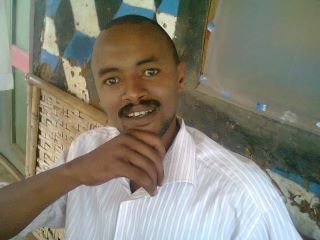 “It was not just Yenesew who was burned, all Ethiopians are also on fire. How long can we be beaten? How long are we going to get brutalized?” he asked. His Holiness noted that the sacrifice of Yenesew, whom many have been referring to as Ethiopia’s Bouazizi, can only be meaningful if people to wage nonviolent resistance to end the injustice and brutality Ethiopians have been subjected to under the Meles regime. “Ethiopians should rescue their people and country by making concerted efforts to remove the tyrannical regime terrorizing innocent citizens,” he said. The archbishop pointed out that the people of Ethiopia have lost their dignity and freedom. Abune Mekarios, one of the most influential archbishops in the synod, said that it was high time to struggle to bring about democracy and freedom in Ethiopia. He strongly condemned the atrocities being committed against innocent citizens and journalists who are unjustly labeled terrorists. “The Ethiopian people have never been terrorists. It is the government which is terrorizing the people…It is the leader who is the terrorist,” he said. His holiness further stated that the Internet era has made it impossible for tyrants to go away with their lies and injustice. In a separate call for unity and solidarity among Ethiopians to commemorate the sacrifice of Yenesew, Sediq Ahmed, representative of Ethio-American Muslim Advocacy Committee, said that Yenesew did not sacrifice himself in vain. Though he died in body, his spirit remains with us as he symbolizes Ethiopia’s yearning for freedom and justice. Sadiq called on all Ethiopians to set aside religious, political and ethnic differences and seize the moment as it is high time for change. Meanwhile, crackdowns in Waka town have intensified. According to ESAT sources, the Federal Police and security agents have been rounding up young men and local elders who are suspected of inciting the peaceful resistance in the area that escalated last Friday with the self-immolation of Yenesew. Many residents have fled the town while over 80 people were said to be rounded up in the past few days. According to local sources, the ruling party has been making futile efforts to try to discredit Yenensew and other Dawro activists in a futile bid to diffuse widespread outrage among the people. Attention please, all spam comments will be deleted promptly. Please respect each others views and opinions. Do not post Web links..
● Holy Bible & Its Studies [AR]..
● Agbeya and other Prayers..
● Pope Shenouda and Coptic Popes..
● Lyrics of Songs & Hymns..
● Coptic Books & Daily Readings..
● The site's visit to Ethiopia 2008..